The wines of the D.O. 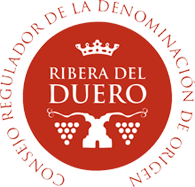 Ribera del Duero are mainly red , although there are pink . The most distinctive grape variety is called Tinta del Pais generically known in the wine world as Tempranillo , which constitutes over 90 % of production . Very specific climatic conditions with the fundamental characteristic of culture care of the vineyard on the banks of the Duero. This climate is a clear influence on crop cycles , marking the evolution and maturation of the fruit.